This page is for the original game. 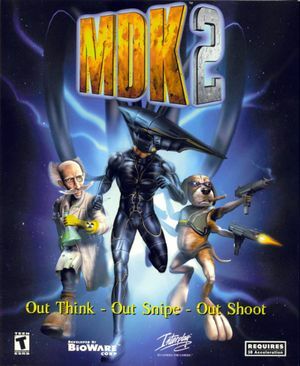 For the re-release, see MDK 2 HD. SafeDisc DRM[Note 1]. Not working on Windows 7 and higher. 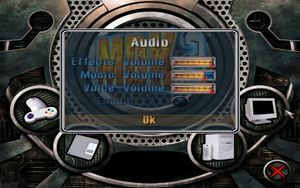 Use MDK 2 Controller Mod for full XInput support (uses XInput Plus). 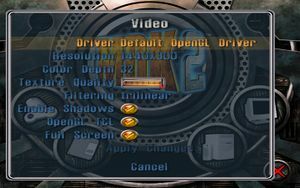 Don't use the Guide button on your Xbox 360 controller for this game while using Steam Big Picture mode. Doing so will have the game bug out in strange ways. 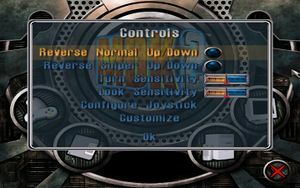 Unofficial localization by «Fargus Multimedia». Attached as bonus to GOG version. Make a profile for <path-to-game>\mdk2Main.exe in Radeon Settings or the Catalyst Control Center. Set Wait for Vertical Refresh to Always On. Run the game with this profile active. ↑ 3.0 3.1 File/folder structure within this directory reflects the path(s) listed for Windows and/or Steam game data (use Wine regedit to access Windows registry paths). Games with Steam Cloud support may store data in ~/.steam/steam/userdata/<user-id>/38460/ in addition to or instead of this directory. The app ID (38460) may differ in some cases. Treat backslashes as forward slashes. See the glossary page for details.